Are Christians supposed to follows the laws found in the Old Testament? In part 1 of this series on the various in Deuteronomy 21-25, we saw that there are some very curious and bizarre laws, leaving us wondering why God would want his people to observe those laws. Thinking about all the laws in the Old Testament and how they might apply today, why do Christians follow some and not others? In part 1, I introduced David Dorsey’s four-part method which helps Christians understand every law in the Old Testament. Today we look at Step 1. Step 1: This law is not for us. This law is part of God’s covenant with the ancient Israelites. We are not them. We are Christians, part of the body of Christ, the church, and we are under a different covenant with God. Our covenant is called the new covenant. During worship at Faith Church on most communion Sundays I read from 1 Corinthians 11:23-25. In this text, written by one of Jesus’ earliest followers, Paul, we find Paul reflecting on Jesus’ words to the disciples at their last supper together before Jesus was arrested and crucified. Did you hear that? Jesus was saying that through his blood shed for us on the cross he was enacting a new covenant. That means that through Jesus’ death and resurrection, we, his disciples, his church, are in a new covenant relationship or agreement or treaty with God through him. What is that New Covenant? The book of Hebrews talks about it a bit more, and I think it is important that we read this. Turn to Hebrews 8:6, where we are jumping into the middle of a longer discussion about Jesus’ role as priest and how he compares or contrasts with the priests of Israel who were under the Old Covenant. I would encourage you to read Hebrews chapters 7, 8, 9, and 10 at some point. But before going any further with this post, please quickly glance through Hebrews 8:6-13. The New Covenant is God’s agreement to transform our lives, as we believe in and follow him, because of Jesus’ death and resurrection, and the gift of the Holy Spirit. What that means is that we have a whole new agreement with God. As the writer of Hebrews clearly says in 8:13, the Old Covenant is obsolete. It does not apply to us. We Christians need to hear that clearly. We are not bound by the terms of the Old Covenant. Any and every law in the Old Testament is obsolete for us. The Old Covenant was in force for Israel, until Jesus died and rose again. There is not a single law in the Old Testament that we have to follow, simply because it is in the Old Testament. We follow the terms of the New Covenant, which is the teaching of Jesus and the apostles in the New Testament. They think, “Wait, you don’t mean the Ten Commandments, right? We certainly have to follow them.” And I respond, just as Dr. Dorsey said, that the Ten Commandments were part of God’s covenant with Israel. We do not have to follow them. We are not bound by the Old Covenant. Usually people hearing this are shocked at this point, still not sure if I’m serious. But I’m serious. Hebrews 8:13 leaves no wiggle room. The old is obsolete. And that goes for every single part of the old. So am I saying that it is okay to murder or steal or lie, to break the Ten Commandments? No, I am not saying that. 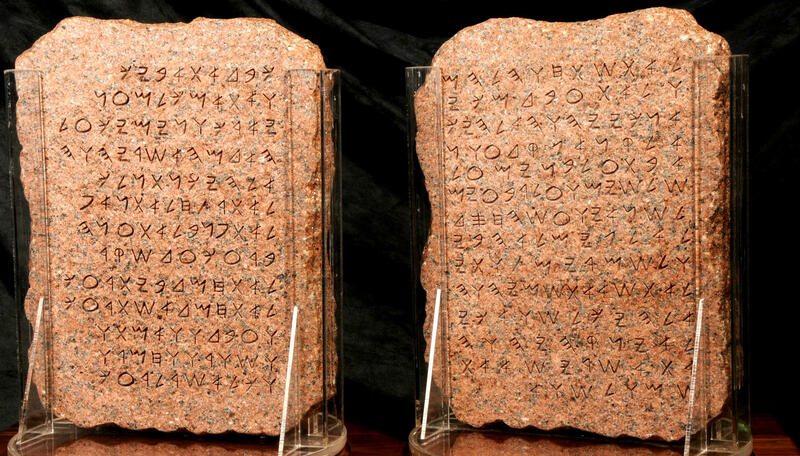 Here’s why: nine of the Ten Commandments are reaffirmed in the New Testament! There is one that is not, though. You know which one? Sabbath. Jesus actually gets into an argument with the Pharisees about the Sabbath Law. He says that the Sabbath is made for man, not man for Sabbath. Jesus’ point is that, even for Israel, God never intended Sabbath to be some rigid rule that he wanted his people to follow. Yes, there were some clear specifics, like no working from Friday sundown to Saturday sundown. But at the heart of the law was God’s desire for Israel to rest and trust in him. Christians have no comparable Sabbath law. If we say that Sunday is the new Sabbath, we are misinterpreting God’s word. Therefore it was wrong for Christians, now and in the past, to say that it was sinful for Christians to work on Sundays. If a person chooses not to work on Sunday, that is certainly up to them. But Christians should not be judging or condemning one another for working on Sunday. Many simply have job schedules that require Sunday work. Further, the same goes for doing the laundry or mowing the grass on Sundays. For some, doing those chores is actually restful. So when it comes to any Old Testament law, we simply have to go back to Dr. Dorsey’s Step 1, that every single one of the Old Testament laws are not for us. They were, however, part of God’s covenant with Israel. So no matter what rule you are reading about, parapets on roofs, tithing, charging interest, any of the 600+ laws in the OT, those rules are not part of our new covenant simply because they exist in the Old covenant. What Dr. Dorsey says, then, is that we can’t leave it there. After getting a firm grasp on the idea that these laws were not meant for us, we now go to Step 2. More on that in our next post.